We love getting dressed up for these awesome mixers! Exchanges with other campus fraternities are usually themed. In the past, Sigma Kappa has set themes such as SigChella, Back to School, Nightmare on 5th Street, Greece Lightning and more! 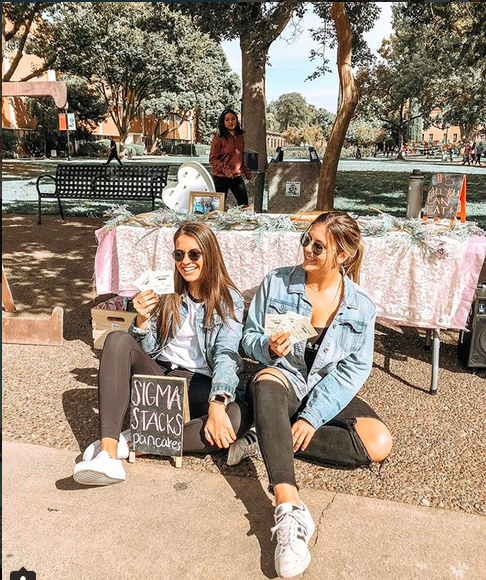 Throughout the year, we host both a Sigma Kappa Dad's Weekend and a Mom's Weekend. Dad's weekend is full of fun activities like barbecues, batting cages, mini golfing, and more! Mom's weekend includes events such as a brunch at Candlewood Country Club, succulent planting, tours of the house and a private shopping party at For Elise! Sigma Kappa hosts two formal dances during the school year; winter formal and a formal in the spring. The Delta Iota Chapter also hosts 2 T-shirt Dances throughout the school year where you and your date get matching shirts to dance the night away in. Past themes include, The Great SigKapsby, Outta This World, and the Sigma Kappa Speedway. Both of these events are the perfect time for Sigma Kappas to dance, and have a blast with their dates.